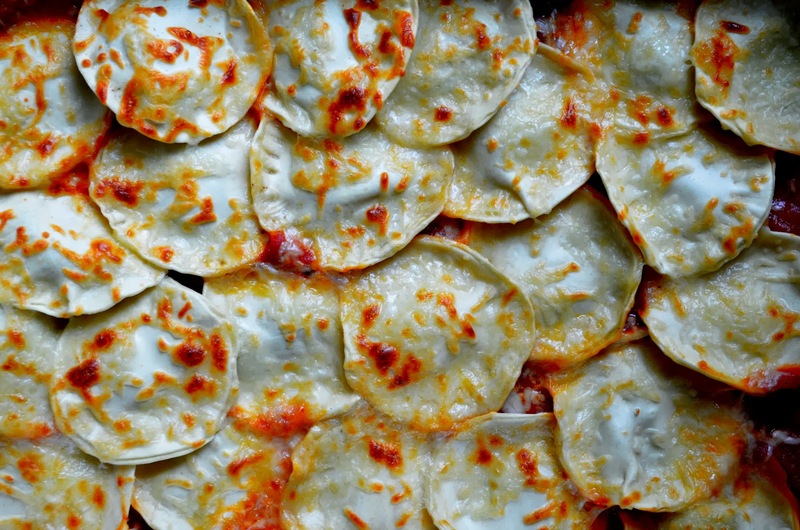 Pesto Cheese Ravioli with Crispy Cheese Topping for Meatless Monday! Ravioli is one of the ultimate comfort foods for me. I know some people love soup and some people love meat and potatoes, but for me? Ravioli. It's always warm with a slightly sweet or spicy sauce on top and a creamy filling that's bursting with flavor. 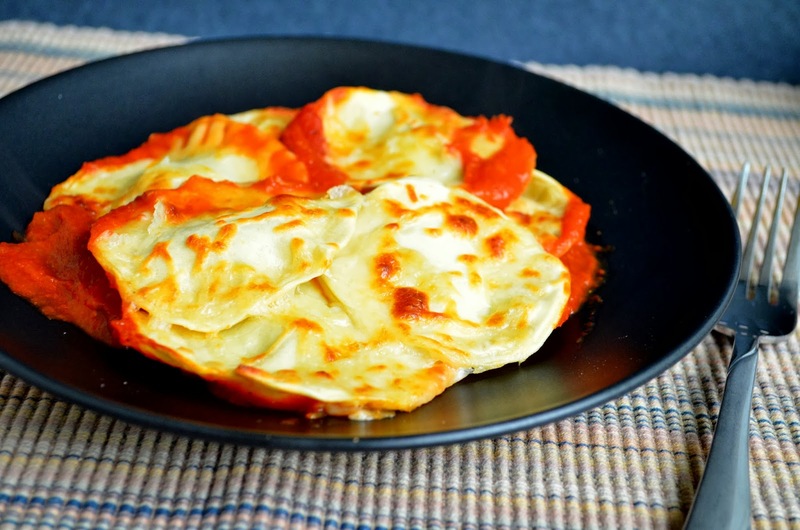 The crunchy topping on this ravioli makes it one of my favorites. The basic flavors of this recipe combine to make something that will keep you coming back for more. I usually prefer a challenge in the kitchen so I made the pasta from scratch, which honestly isn't a challenge at all, but fun and relaxing for me. Making the pasta dough takes only a few minutes in a food processor and as a bonus I can add whatever flavors I want to, such as additional herbs or spices. That, of course is why I enjoy cooking in general. I also love the pastas that are different colors, maybe I should try some spinach pasta dough one day. I will say that I have a pasta roller attachment for my Kitchenaid mixer so the rolling part is super easy. If I were rolling it with a rolling pin I'm sure it would take a lot more effort (as I've done it many times before). But homemade pasta has a different flavor than store bought pastas do. I'm pretty sure that at least a little of that amazing flavor is the "love" put into it :). 1. Prepare pesto filling: In the bowl of a food processor combine the basil, ricotta, parmesan cheese, olive oil, egg, salt, and pepper until smooth. Set aside. 2. Add the flour and salt to the clean bowl of a food processor and pulse 2-3 times to combine. In a small bowl whisk together the 2 eggs, water, and olive oil. With the processor running add the liquid and blend until the dough comes away from the sides of the bowl, be careful not to overmix the dough. Wrap the dough in plastic and chill for 1 hour. 3. Roll out the dough to ⅛” thickness and cut 2 ½” circles using a cookie cutter. Dollop about 1 ½ teaspoons of pesto cheese filling onto one side and wet the edges of the circle with water using a brush, place another circle on the top and press them together using a fork. 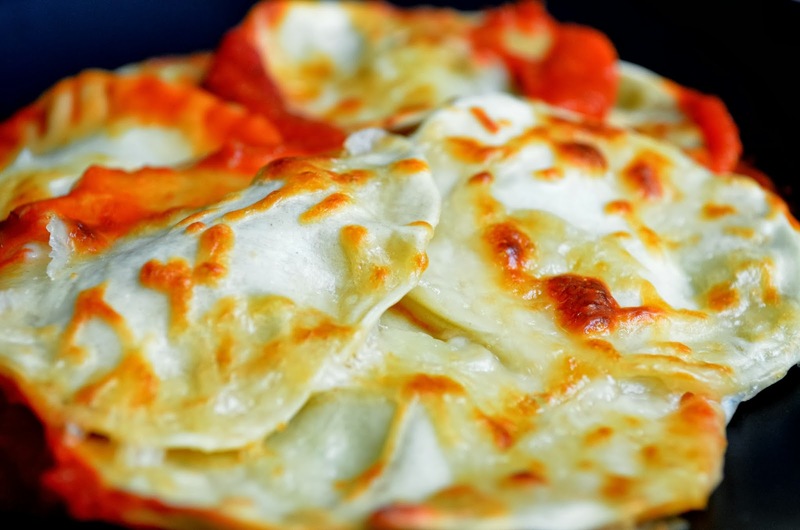 Alternatively, roll out the dough into long strips, dollop the filling every 2 - 2 ½” and place another strip on top, then press around the filling and cut using a pizza cutter into squares. 4. Preheat oven to 400F. Boil the ravioli in small batches 2-3 minutes each until cooked through, set aside. 5. Spread the marinara evenly onto the bottom of a 9” x 13” baking dish. Place the ravioli evenly on top of the marinara. 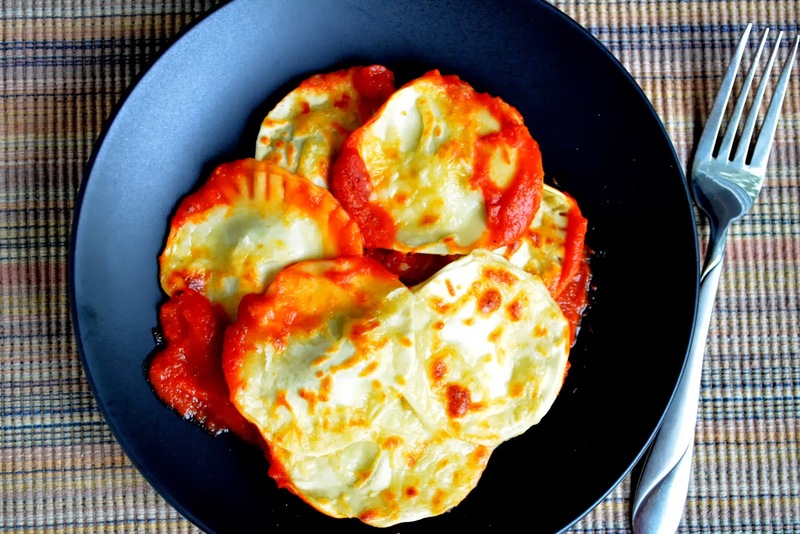 Sprinkle with ravioli with the shredded Italian cheese. Bake for 20 minutes or until the cheese is golden brown and bubbling.